(TibetanReview.net, Sep28, 2018) – Apart from “Sinicization” of religion, which requires religion to be subjected to an ever-widening range and depth of communist party controls, China is imposing ban on religious belief on increasing categories of citizens. The ban now extends to government employees, including schoolteachers and medical personnel, apart from school children, reported the Mandarin Service of rfa.org Sep 26. The report said that teachers working in high schools in some parts of the eastern province of Zhejiang were being asked to sign a letter pledging to hold no religious beliefs. The report cited a Zhejiang-based Christian as saying the move was linked to a recent visit to Wenzhou city, whose numerous Christian churches have earned it the nickname ‘China’s Jerusalem’, by investigators from central government in Beijing. The report said authorities in Wenzhou’s Ouhai district had put out a short video that was mentioned when the schools were holding their meetings, saying teachers mustn’t hold any religious beliefs, and, in particular, mustn’t proselytize in schools. All the schools in Zhejiang are said to require teachers not to follow any religion, because there was an investigation team from the central government in the province from mid-Sep to around Oct 10. Photos posted to social media of a “Teacher’s Commitment Letter” issued to teachers at a school in Yueqing was said to require them to “adhere to the correct political direction, promote atheism, firmly establish a Marxist religious outlook, not believe in any religion, and not teach any religious knowledge to students”. Also, students who tick the box owning up to religious beliefs in a form in which they have to fill their personal details as opposed to “no religious beliefs” were reportedly being called in for a “chat”, the report said, citing a Christian church member from Rui’an district of Wenzhou. Similar “letters of commitment” to uphold atheism were reportedly being handed out to healthcare professionals in Yueqing. The report said Medical staff at the Yueqing Maternal and Child Health Hospital had recently been issued with a letter requiring them to pledge not to follow any religion or participate in religious activities. The letter was also cited as saying any staff organizing or participating in religious activities in the hospital may be fired if the circumstances were judged to be “serious”. Also, staff were reportedly banned from wearing any clothing linked to any form of religious belief, and may be subjected to “education”, with further offenses leading to dismissal from service. The report cited a Protestant pastor in Hangzhou city as saying, asking to remain anonymous, that the banning of religious beliefs was continuing across schools and medical facilities in Zhejiang. The report also cited a Protestant church member as saying similar moves were afoot in the eastern province of Jiangxi. “Hospitals in Xinyu now have banners and notices up [about this], while teachers in schools are banned from following religion,” he was quoted as saying. Health authorities in Jiangxi’s Wanzai county were reported to have issued an “emergency notice”, saying all medical and healthcare facilities calling on them to set up a mechanism “to prevent religious beliefs among medical personnel,” and another to punish offenders. 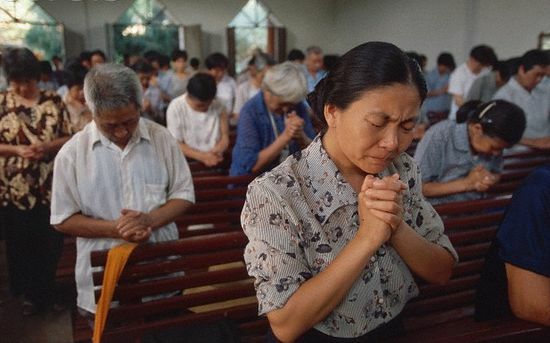 Also, schools in Zhejiang, Jiangxi, and Henan provinces had reportedly already asked students to register any religious beliefs, while also carrying out a census of churches, their sources of funding and possible links to overseas organizations.